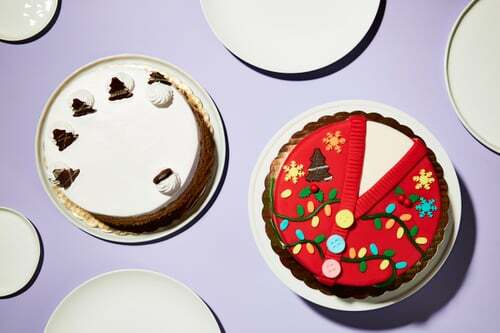 The holidays are a time to get sweet and silly, so we've teamed up with Cold Stone Creamery to help you put the icing on the cake. 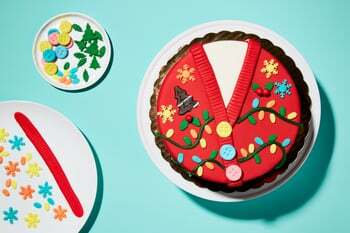 If you want to make an impression this holiday season, wearing an ugly sweater or serving a crowd-pleasing ice cream cake are both solid strategies. 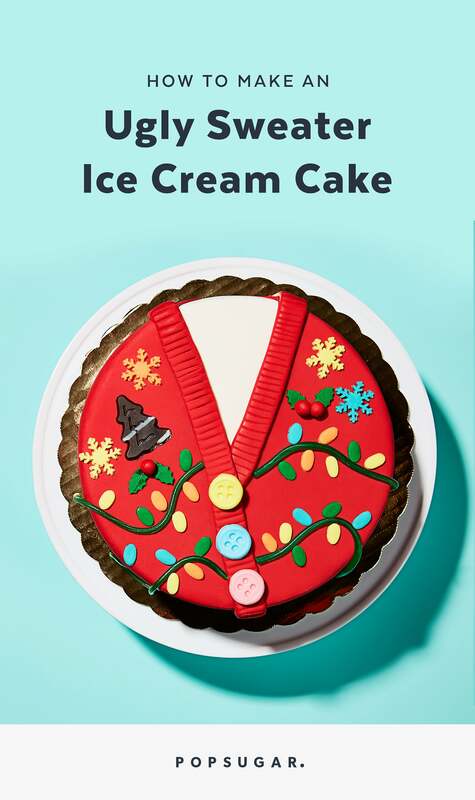 But you could go one better and fuse the two in the form of an ugly sweater ice cream cake! 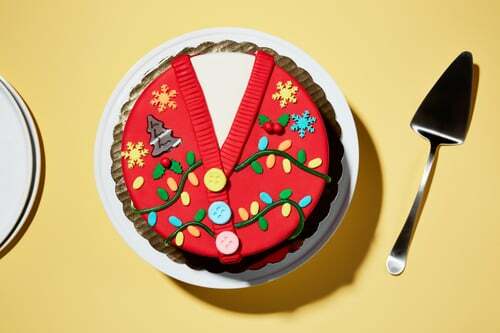 Our adorable cake comes together much more easily than your real holiday party outfit, it'll give dad some serious holiday outfit inspo, and it's delicious. Here's how to get buttoned up for the holidays. The cake: We used Cold Stone Creamery's newest Holiday Cake, Caramel Chocolate Cheesecake Wonderland™ . It comes with layers of moist Devil’s Food Cake and Caramel Chocolate Cheesecake Ice Cream, with a Graham Cracker Pie Crust — all wrapped in fluffy white Frosting. We used a large round cake and incorporated the toppers into our design. You can choose from tons of flavor combos, customize with your favorite mix-ins, and top with fluffy white frosting or rich fudge ganache. Whichever cake you start with, trust that you're going to look like you put in a lot of effort! 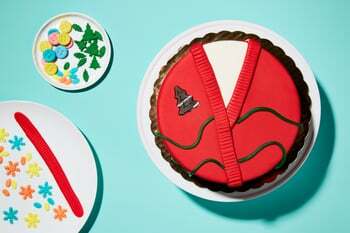 The sweater: Select fondant in your chosen color for the "cardigan" base, then pull-apart licorice laces, as well as candy balls, buttons, snowflakes, and festive leaves to decorate. There are no wrong candy answers. Line up all the ingredients before you take the cake from the freezer and slide it onto a serving plate. You'll have to work fast. Roll out the fondant using a rolling pin, then gently lift and drape it over the cake. Starting at the top and working down the sides, smooth away air bubbles and creases using a cake smoother. Cut away excess icing and a deep V for the neck with a small, sharp knife, reserving strips for the neckline and cardigan seams. Create indents in the seams with a butter knife. 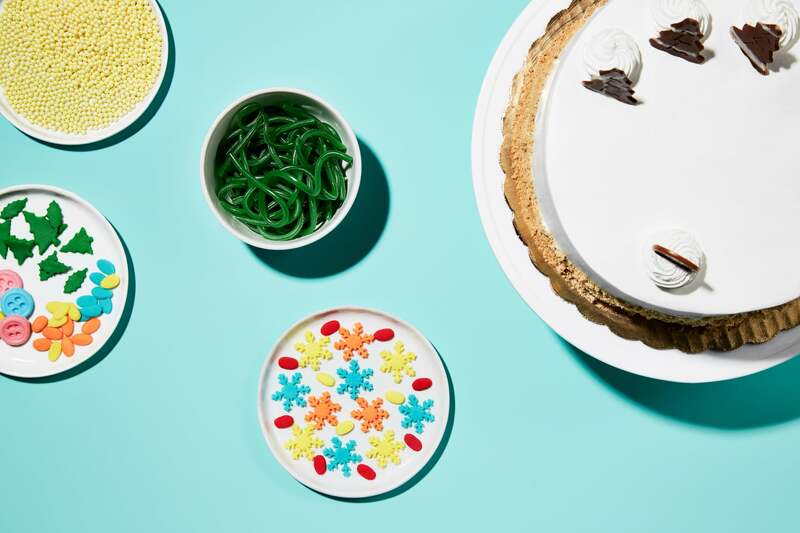 Now here's where it gets ugly: arrange licorice laces and candies to form Christmas lights, then add more candies, fondant cutouts, and buttons. Now that your ugly sweater is ready to serve, be sure to plan an unveiling party — complete with its own Insta hashtag and ugly sweater group shot — to celebrate. Store any leftovers in an airtight container in the freezer, and eat within seven days. Enjoy!